I ‘m going to miss this guy…oh wait, he’s going to be my neighbor now! So glad Cody will be on the Sox (wearing his sox high) and not, say, the Rockies. 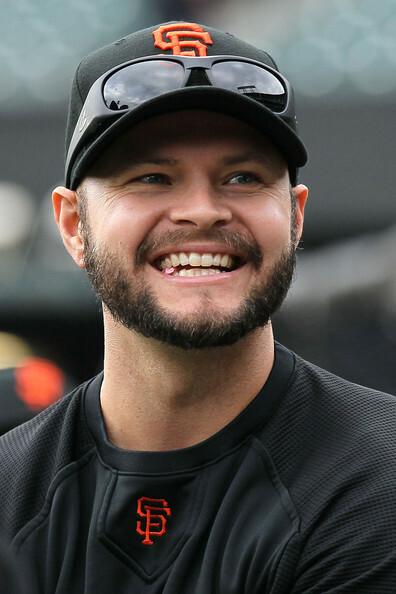 I will buy a seat in right field just so I can scream “thank you cody ross” at him 100 times during the game. There’s been a lot of goodbyes from the 2010 Championship squad, as Grant has pointed out, and I think Cody (along with Pat Burrell) represent just how special that season was..but then so does Andres Torres, and Juan Uribe, and Edgar Renteria, and it goes on and on. I run into a lot of Philly fans out here on the East Coast and hands down the two guys people hate the most: Cody Ross and Tim Lincecum. It’s a toss-up who is hated more. They hate Ross because he symbolizes how “lucky” we were in 2010, and they hate Timmy because he symbolizes how awesome we are at pitching how weird San Francisco is (his name is usually followed by a joke about weed, loose morals, or something along those lines…like the Phillies have been full of such solid dudes over the years). Speaking of Tim, I’m pretty pleased with the contract he signed. The 5 year, $100 million deal would have been the best case scenario for the Giants, but I really like being able to take two years and see what he’s got before going all in. Especially if the Cain rumors are true. So this is it, pretty much, for the off-season. Here’s your 2012 SF Giants. They could have done better, they also could have done worse. I still think that while it would have been great to see Beltran return, in the end, the shortstop situation is the big miss of the winter. Maybe the Giants brass know something about Crawford, or Panik, or someone else, but I this and sorting out the OF/1B as the two big issues of the early season.